A wonderful renovation welcomes everyone and when we entered, the place was jammed pack full for the noon-day lunch hour! Having dined at the Main Street Bistro, (Chez Fabien is now where they used to be) we were very impressed and excited to be there! Beautiful wooden bookshelves, new tables and fixtures, and a new updated bar area have all taken this place from old and rustic into a very new, modernize version of a bistro. However, after you sit down for a few minutes and look around...something peculiar begins to stand out: for the middle of the lunch rush hour, hardly anyone has any food on their tables. Then, after at least 5 minutes, you look to your table and ask, "has anyone seen a waiter?" I knew if I went to the restroom, my luck would have a waiter show up, so I went to the back...and found the door locked. I waited, and waited and waited....a queue formed of maybe 4 gentlemen and i gave up. I returned to the table and found water and menus. The menu seemed to have changed, the Texan styled French fare had disappeared (Fried Duck for example). I chose to order a classic French dish - the Mussels and my companions ordered pulled pork sandwiches. After what seemed like an eternity - those eternities when you look at your watch and say "if the food is not here in exactly 5 minutes, we're getting up and going down the street!" - I stood up and headed back to the restroom. All other 4 men had abandoned their wait, as i had and the door was still locked! Just as i was about to return to my table, a bus boy came to use the men's room and I said, "I think someone's passed out in there, its been locked for a very long time." He knocked on the door to no avail. He then tried to break in and put all of his weight on the handle and a loud pop resounded and he looked inside...I asked, "Is he dead?" He motioned me to look into the restroom only to find it empty. I then returned to our table to find our lunches had arrived. of Cream and Pommes Frites. 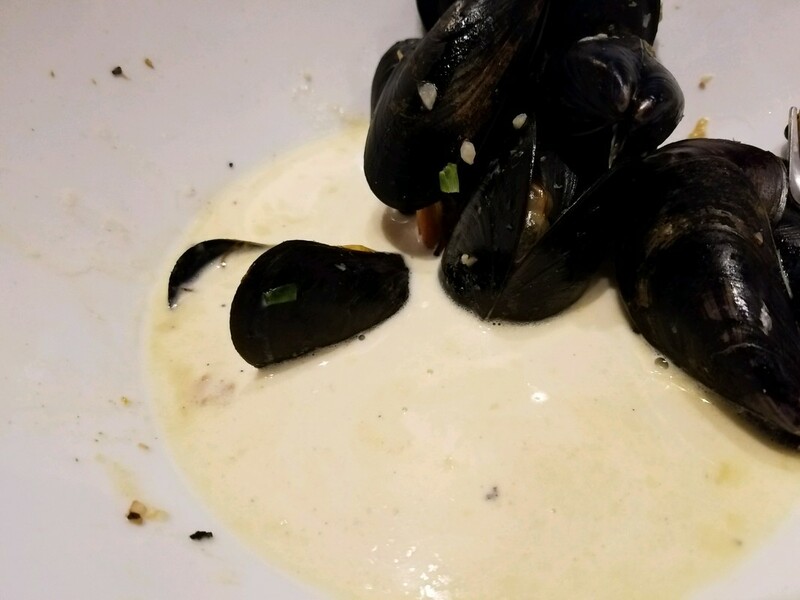 It goes without saying that small mini-slices or a mini-loaf of a baguette accompanies mussels so that one might also enjoy the beautiful cream sauce (usually made of white wine, garlic, shallots, butter and cream). However, no bread came with the "traditional" dish. To make matters worse, the sauce did not have ANY white wine in it at all, it was just a butter and cream sauce! What it should have been was a butter and cream sauce, with white wine, and the garlic and shallots INSIDE the sauce (while simmering/cooking) so that all of those flavors would fuse together and create the classic plate. The garlic and shallots were instead scattered on top of the shells, on the outside, lending nothing to the dish. To make matters worse, the garlic was not fresh and rather taken from a pre-diced jar, which are notorious for lacking flavor (fresh is best). When it came time to eat them, they had not cleaned them. 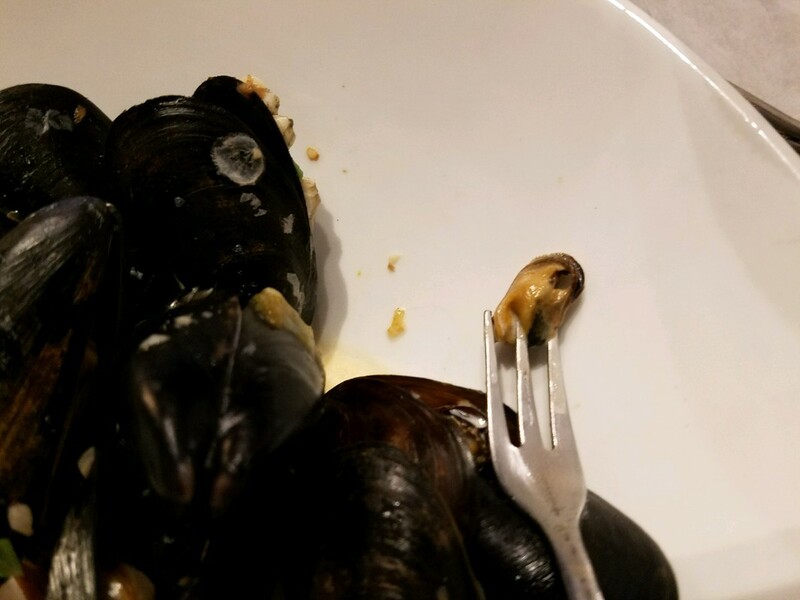 One of the reasons why I always order mussels at a bistro is because cleaning them from the hairs and grit takes an effort and I would rather leave it up to a restaurant. Therefore, with almost every mussel, I could hear that cracking sound on my teeth from the small particles of sand. I had never had that happen to me in France or any other French Bistro in the United States. They also omitted the typical lemon wedge that accompanies the dish. Next,, we noticed there wasn't any ketchup on the table for our Frites, which were not Frites. Frites are those small cut fries, these were regular French fries that you'd expect to get anywhere. If you put Frites on the menu, serve Frites...and if you are a proper bistro (or even McDonald's for that matter) you don't serve them lukewarm and slightly soggy (we all know what this is like, the way fries are when they sit under a hot lamp too long). These fries were not made to order. We asked for some ketchup and none came. After half the fries were gone (due to starvation at this point) we asked another waiter for ketchup and some was brought to us. Our water glasses remained empty. 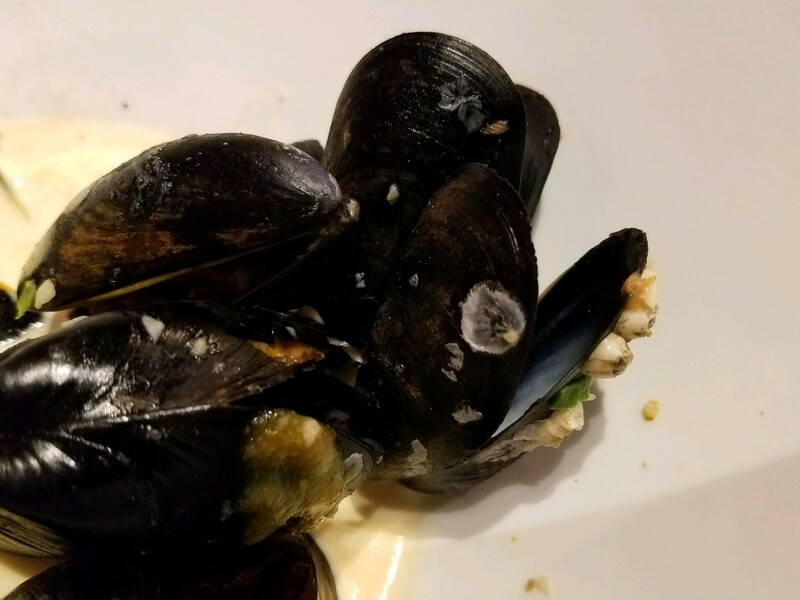 These mussels still have barnacles, hair, and seaweed on them. More evidence that they had not been cleaned. I wonder if they got a deal on baby mussels because that is by far the smallest mussels I have ever seen and most of them were about this size. 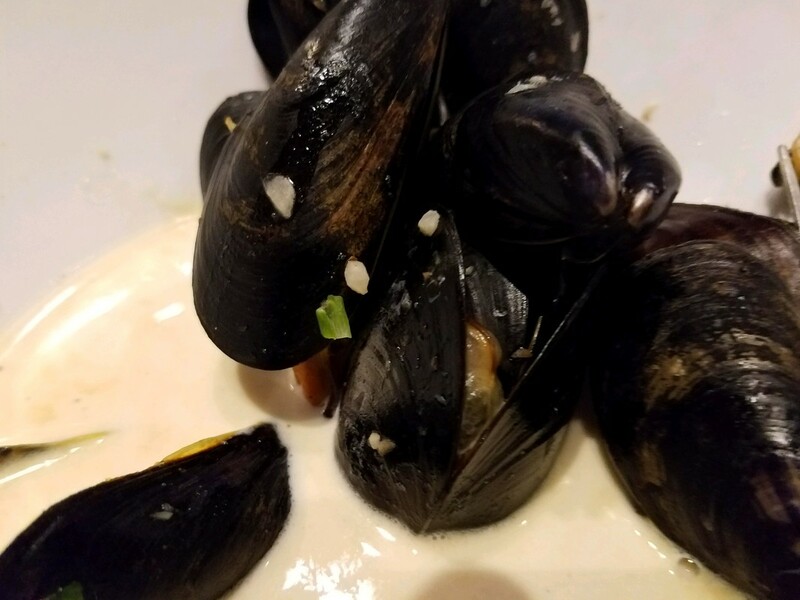 For reference on what a mussel should look like, we cross-reference with our previous posting at Ramen Hakata. Second photo from the bottom of the link shows what was expected. The pulled pork sandwich reads as: With Mango Pico de Gallo and Barbeque sauce. It did not come with barbeque sauce, the fries were cold and flabby and we counted only 3 small cubes of mango in the pico de gallo. The pulled pork was dry and the bread was at room temperature and was not home-made. . This was a huge disappointment and the Bonvivant Gourmets will not be back.